We are located at Level 1, 156 Rokeby Road, Subiaco WA 6008. Our office hours are 8:30am to 5:30pm. We recommend using the 2-hour free parking at the Crossways Shopping Centre (blue on map), either on the roof or undercover at ground level. This is accessible from Bagot Road. 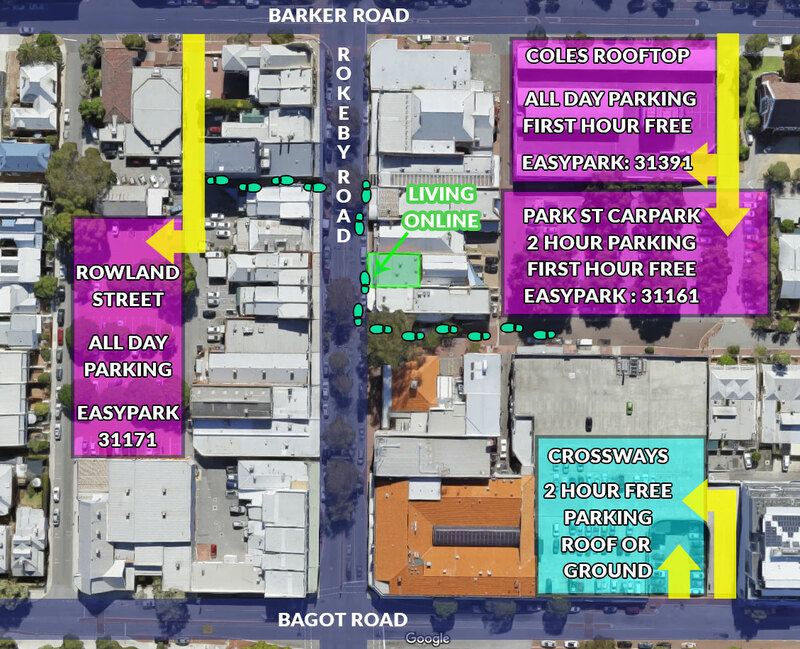 If that carpark is full there is the second option of using the Easy Park app to book parking for one of the nearby carparks (purple on map). We recommend trying the Park Street Carpark first as the first 2 hours is free, although you will still need to activate your parking in the Easy Park app. Download the Easy Park app before you arrive to save yourself time after you park. You’ll also be able to top up your parking from the Living Online office, if needed.